Mr. Goat's Valentine arrived in the mail (quite by surprise) one fine school day. It arrived just in time for Bookworm2 to do a little reading practice and, as he expressed the most interest in reading this book, I had him read it to me! (That wasn't quite what he was expecting, but what are mothers for? Heh.) I noted that this title was written by Eve Bunting but beyond that, I didn't peruse. It wasn't until the end of the story that I discovered just how perfect it was that my bookworm read it to me instead of the other way around. Mr. Goat's Valentine tells us of Mr. Goat who realizes that Valentine's Day has come. He decides he wants to go out and and show his "first love how much she means" to him. 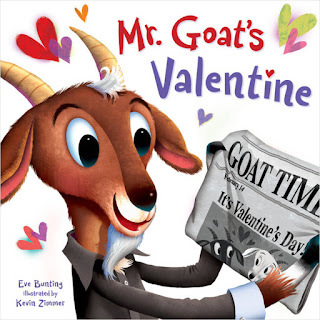 This book details his adventures in selecting the finest Valentine treats that a goat could want (rotten eggs anyone?). The conclusion of the book brings us straight to his first love's front door. Who might it be? Why, his mother of course! Cue the "awww!" I think this story is adorable but then I'm rather biased towards stories about little boys who grow up and remember to show their mothers how much they love them. Eve Bunting is a noted story teller and she doesn't fail to deliver a cute, impacting little tale. The only drawback from this book - in my opinion - were the illustrations, done by Kevin Zimmer. He's just not my style (even though I feel bad in saying so). I'm having a hard time explaining why, exactly I don't like them, except for they feel "cheap" somehow. (I know, I know. That sounds terribly rude.) The lines are too simple, the colors too bold and it's just too . . . simple? I love artwork that is more detailed and realistic and Zimmer doesn't give that. Some people won't be bothered by his illustrations in the least but I thought the story would have been better complimented with more "cute and cuddly" instead of the cartoon-y feel they give off. Again, this is my opinion and others will no doubt differ and we shall all be glad. We each have our preferences. Zimmer didn't suit me but Bunting did and the story is adorable, no matter. If you're looking for a fun new read this Valentine's season, you might want to look this title up! Many thanks to Sleeping Bear Press who kindly sent a copy of this book my direction in order to facilitate a review. I received no additional compensation and truly, if you don't believe that all opinions expressed above are my very own then you don't know me very well, do you?